Serge Onnen is a French/Dutch artist, trumpeter in the band Oorbeek, and longtime friend of zingmagazine. He has had a project in #17 of utopian trees, a zingbook of face drawings titled Volume O, and video work and wallpaper in the Dikeou Collection. Serge’s new book coming out with J & L Press is called Drawings on Hands. He will also be in the upcoming issue of zing, #22. Your new book, Drawings on Hands, is very obviously about the drawing of hands in their various positions and actions. Can you tell me more about it? Each of the books has a very simple starting point: heads, horizon, writing, and now hands. This book is more or less 50% found, unknown drawings and 50% artists’ material. The goal is each time to make an intelligent book about something simple without the use of text. I want the viewer of the book to wander around, without too much distraction. There's very little information in the books. So when I pick something as general as drawings of hands, I first have to make all sorts of categories: tarot, sign language, manuals, religion, medical, magic-tricks, etc, etc. And of course collecting the artists’ material. I research all fields until I find drawings that are interesting and not too obvious. The collecting and shifting takes a long time. Stacks of hand drawings become smaller and smaller. I start making connections, story lines, jokes. It's all very precise. There's something anonymous in the design, a stack of paper with an elastic cord around it. And also many of the drawings I pick have this anonymous quality that manuals have. But at the same time, drawing is a very expressive medium, so that remains, even if it's a blown up lousy jpg. I didn’t realize you had done all these thematic books in the same way. I was familiar with the heads book as we published it along with zingmagazine #16, but haven’t seen the horizon or writing books. In fact, there are a few hands that appear in the heads book. It seems to be a mark of distinction – a level of achievement – to be able to draw hands well. As an artist who does a lot of drawing, what is your particular interest in hands? But it's really all about the books and their design. Drawings on paper, not drawings on screens. I personally think feet are harder to draw, but it's true that I draw lots of hands. But I don't really notice it anymore. Your hands are always there. Available. It's the part of your body you have the most eye contact with. They are very flexible, more so than a face. You can put every expression you want in a hand and it will still keep a certain anonymity, gender is irrelevant. And of course the idea of “hand made”. I like art to be made by a human; that's a very powerful aspect of art-making to me. But, it's never about “hands,” I guess. Nor in my book or my work. I find hand studies as a topic boring. A left hand draws a self-portrait on a sheet of paper. The hand leaves the room. Another hand picks up the drawing and looks at it. "Why can't I do this?" This is an extremely jealous hand, and he crushes the drawing. Then he walks toward a hand mirror, opens himself and pushes very hard against his cold reflection. He takes a few steps back and stares at the print made by his heat until it slowly vanishes. So, are you saying it’s more about the actions of the hands and their expressive quality and less about the drawing process of the hand itself? Is it the manipulation of the hand rather than the depiction? Yes, just drawings of hands won't do. Everybody knows how that book will look. I guess I'm not so interested in amazingly well drawn hands. Two of my favorite drawings in the book are of the Japanese tegata drawings. This is an old Japanese tradition where sumo wrestlers ink the palm of their hand to make prints and then give these to their fans. There is one 18th-century drawing where a sumo wrestler makes such a print. It's still in use today and these prints are collectible. I've been trying to get one. A human print as an artifact. Not as a piece of evidence as it means in western culture - very different to the Hollywood Blvd tradition of hands in the pavement (wonder where that idea comes from, because when I think about actors, their hands are not the first thing that comes to my mind…). But there are also some drawings from an old manual for magicians; Yes! Here the hands are real actors. Actually, that’s funny you bring up the Hollywood handprints. Devon [Dikeou, artist and editor of zingmagazine] did a piece called Norma Taldmadge’s Chinese Theatre based on the origin of that tradition. The actress Norma Talmadge accidentally stepped onto wet concrete in front of Sid Grauman’s Chinese Theatre, starting the tradition. But moving forward, you have a project in the upcoming issue of zingmagazine called “Insurance Value Drawings” featuring catastrophic collisions of insurable objects – a grand piano dropped onto a crushed palette of iMacs – along with cost of the products destroyed. Where did the idea for this series come from? So, the handprints started as an accident? Well, you could say the insurance value drawings started like that too; when you have a show in an institution or museum you’re always asked about the insurance value of the work and that is always something much lower than the market value. So, art has many different prices; as destroyed, so to speak, “dead;” or as “art”, so to speak, eternal. In the past, I’ve had pieces that were not sold and I wished had been destroyed. I destroy work constantly without ever getting paid. It's another value dilemma. Like everything in our world. There's not one thing that can't be priced - this idea is still puzzling to me. But there is also something else; with the goods in the drawings (most items are on pallets), I also thought of the meanings these objects have; so when you drop a Steinway on a pallet of iMacs you will not only get a great sound, but also some kind of conflict, revenge; old vs. new (well, the iMac is old today, but was quite new when the drawing was made! so that's also interesting, the meaning has shifted). Also, the long tradition of dropping grand pianos in art and slapstick. I like objects destroying each other. A fallen tree on a car, fallen book-shelves, stuff like that. It's melancholic—it’s not the violence of hurting. Each insurance drawing is also a composition: a motorcycle & olive oil, a motorcycle & Nespresso, telescope & M&M's, lingerie & crude oil. In that way it's not a real accident—they're sketches for beautiful swindles. There are a lot of musical instruments among the insurance drawings. Music & violence is a good match. Guitars also have this powerful meaning when crashed, but when it's crashing into cans of Nivea for Men, it becomes as ridiculous as most rock and roll bands that will smash a guitar nowadays. The Gretsch guitars vs. Jack Daniel's is more the idea of two delicate brands. You can crash as many Fender Stratocasters as you like but don't dare touch the Gretsch! Two brands that play with “classic rock” & “good taste and connoisseurship” and being “exclusive.” And all that crap. I'm not saying these aren't good products, that's not my point. Originality has nothing to do with exclusivity. But all these brands try to make you believe it's the same thing. They will only gain originality when damaged. Oh, something very funny happened with the motorcycle & Nespresso drawing; a few months after I made that drawing, George Clooney got into a motorcycle accident! In Europe he is Mr. Nespresso. You mention the lack of violence in objects destroying each other. There’s a similar theme of crashing and smashing in your video piece at the Dikeou Collection called Break in which two hands slap together to smash things, like a beer mug. In your statement for this piece, you say that violence in animation doesn’t hurt. Is the fictional aspect of drawing important to you? Does is provide a sort of outlet for violence in the world? 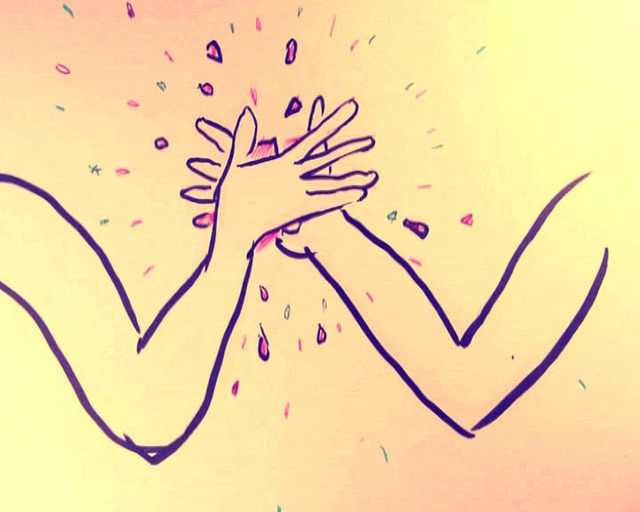 In that animation two hands crash objects against each other but are gentle to each other. I think I always had a fictional attitude toward drawing; as I child I made sounds while drawing and the characters had voices. Very often they were fighting, that's true. When I draw I need to get inside the world I'm creating. Then I can try to rule it and believe it's good or not. It hasn't chanced so much, only the worlds I draw have changed. So when I started to work with animation and studied its history, I noticed how violent it has always been. In an animation you can transform anything. Violence is, of course, transformation. Animation always plays with these ideas. It means something else and that is always interesting. You just take that violence for granted, even if it's not funny. It's fun to drop a anvil on someone's head in an animation, but in a movie that will become a splatter scene. I don't enjoy violence in movies. But I do in music, drawing, etc. On the other hand, your project in zingmagazine #17, “Sanitary Park,” looks at a “place where everything is clean and perfect. A man-made park where no human is allowed.” There are drawings of trees, interconnected page to page, with ends that are amputated stumps. They are abstract, organic, a “pure environment.” This is in stark contrast with the messing smashing and crashing of “Insurance Value Drawings” and Break. Can you tell me how this project relates to the rest of your work? Holland, where I live most of the time, is totally man made, as you may know. It's the 17th-century's Dubai. All the work I did about 10 years ago for "Sanitary Park," around a hundred drawings and a show in Holland's biggest hospital, was about creating a park out of drawings. A safe and secure zone; like one finds also in a bathroom or hospital. These places must be very clean, sterile. Industrial and organic. Places where one thinks it's safe to take off ones clothes. The zing drawings are the extreme version of that idea, amputated, no humans allowed. It's also a lot about the idea in the urban brain that nature is pure. That is the way it's being represented: "purity is a invention of the police" like one of my heroes Roland Topor said. I need to go back to the work I did before Sanitary Park to explain how one thing leads to another. Those drawings were “heavy bags.” People in and with bags. You never know if they're vagabonds, hikers, homeless people, refugees. Leaving things behind and going into the wild voluntarily or non-voluntarily. The romantic and the dramatic version hand-in-hand. So, there's often a 'better world' fantasy in my work I guess, playing with those ideas of rejecting society or being rejected by it. The violence only came in when I started to work with animation. But always object-related violence and also always repetitive, rhythmical, in the drawings, animations and also in a wallpaper I designed. I did a wallpaper where champagne-glasses are being toasted very cheerfully and violently. I call that “violent choreography.” It's a composition, like the insurance drawings. I like objects that have something dangerous and something human in them. Like a fork is a little hand-prosthesis. Or a pair of scissors that looks in many ways like eyes: they blink, have two eyes, and will always keep their elegance. Beautiful. It’s great to hear about your past work in zing and how it relates to your body of work as a whole. Besides your upcoming project in zingmagazine #22 and Drawings on Hands, is there anything else coming up that you’d like to mention? Yes, you develop and change ideas over the years and it's good to reconnect with it using language. I can recommend to any zingchat readers going upstate to DIA:Beacon by train, get out of the train in Peekskill and check out my kaleidoscope sculpture “monetariumplanetrarium” on the waterfront, part of the Hudson Valley Art Centre. It's a piece I'm real proud of!